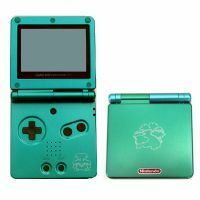 Venusaur Game Boy Advance SP's are now available. Also they go great with Pokemon LeafGreen or FireRed. The Venusaur Game Boy Advance SP's are LeafGreen with imprint of Venusaur on the cover and the front. If you want to get it you can get it at www.pokemoncenter.com also it can be a great gift for any Pokemon fan too.